Many of you have been eagerly anticipating the new series of Siddha Yoga meditation sessions on the Siddha Yoga path website. I am delighted to let you know that the series begins this month on February 27. These sessions were created to support you in applying Gurumayi’s Message for 2016 to your meditation practice. Over the course of the year, a team of experienced Siddha Yoga meditation teachers will show you pathways to the source of bliss that is always present within you. You’ll learn to connect with that bliss, and to let it suffuse your meditation practice and your daily life. These sessions will be held via live audio stream, so Siddha Yogis and new seekers will be practicing Gurumayi’s Message and meditating together at the same time all around the world. I think you’ll find that there is great power in this unified focus. The first session is titled The Sound that Carries the Mind to the Madhya. It will be broadcast live from Shree Muktananda Ashram on Saturday, February 27, at 10 a.m. Eastern Standard Time, USA. Following the live audio stream, each of the sessions will continue to be available as a webcast, so you can participate again and again! I wish you a fruitful year of meditation as you progress toward the sublime goal described in Gurumayi's Message for 2016. Swami Vasudevananda has been following the Siddha Yoga path for four decades. In 1980 he took monastic vows to become a Siddha Yoga Swami. Swami ji offers seva as a teacher in Siddha Yoga Shaktipat Intensives, Sadhana Retreats, and satsangs. A warm and engaging speaker, Swami ji is widely appreciated for the devotion with which he conveys the wisdom of the Siddha Yoga teachings and the Indian scriptures. As a teacher, Swami ji has the outstanding ability to give students the confidence that they can succeed with great ease in sadhana and in life. Swami ji’s many contributions to the SYDA Foundation include the trainings he has conducted for new Siddha Yoga meditation teachers. 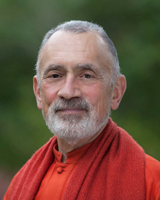 Swami ji is the author and co-author, respectively, of two year-long courses in the Siddha Yoga Home Study Course—The Power of Siddha Yoga Meditation and The Power of Siddha Yoga: Path of the Heart.